There is a great temptation to choose to buy a pair of lovely espadrilles and what is the question? It is not a question. Totally! I guess maybe, looking the longer term because the fashion has a cycle and we are not getting any younger. The first point is in effect as of now and the next logical step is purchase some walkability shoes. 3. Expensive or cheaper alternative? I am convinced it would be a great waste of money for the expensive espadrilles only this you can invest into a kind of leather version, but let you know there is always a risk that espadrilles' soles as a sensitive spot even if they are on little bit higher for example at my new Pradas. In view of these factors I decided to purchase a pair of cheaper version in lace at H&M and I added leather insoles. Plus I rooted out long-forgetten satin pair from my old wardrobe at my parent's house. I think I bought them eight years ago at Mango outlet and we go back to the second point - definitely timeless. Do not you think? 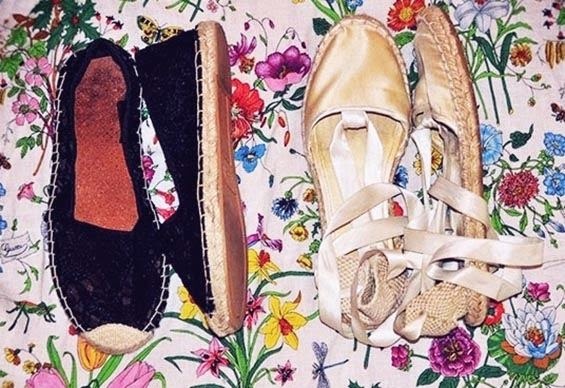 your espadrilles are so so cute! i NEED some for this summer!! I love them too. The Mango ones are amazing! I like the cream ones! awesome! the gold pair is fab! !